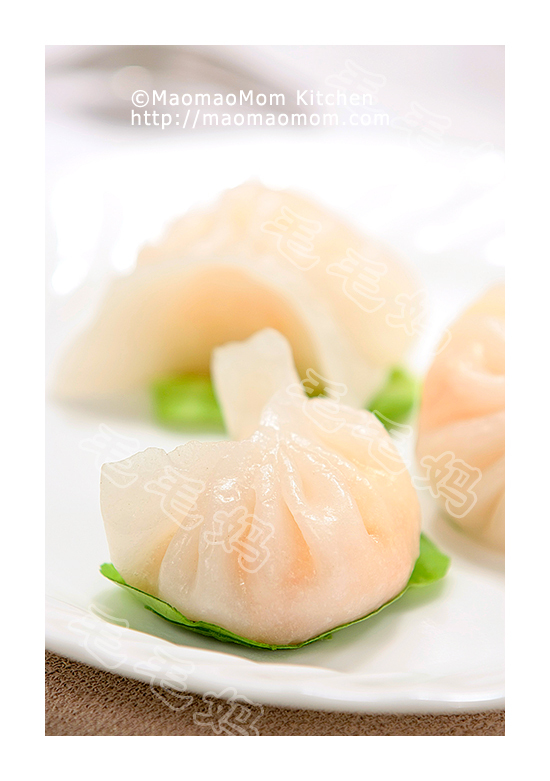 Steamed shrimp dumpling is one of most popular dim sum dishes at Chinese restaurants. They look adorable and taste wonderful. If you gather all the ingredients, you can make them at home. 6) 2 tsp garlic oil. 1: Thaw the frozen shrimp then peel and devein the shrimp. Rinse under cold running water. Press down to crush shrimp with a cleaver and cut into 3 small pieces (Picture 1). Combine the chopped shrimp, minced pork fat, liquid extract from green onion and ginger of Ingredient 2) and all ingredients of Ingredient 3) in a bowl (Picture 2). Stir with a pair of chopsticks in one direction for 2 minutes until the mixture becomes sticky (Picture 3). Set it aside. 2: Measure out 2/3 cup wheat starch and 1.5 tbsp tapioca starch in a medium bowl. Stir in 155 g boiling hot water (Picture 4) until it is well combined. Cover the bowl with plastic wrap and let it stand for 5 minutes. 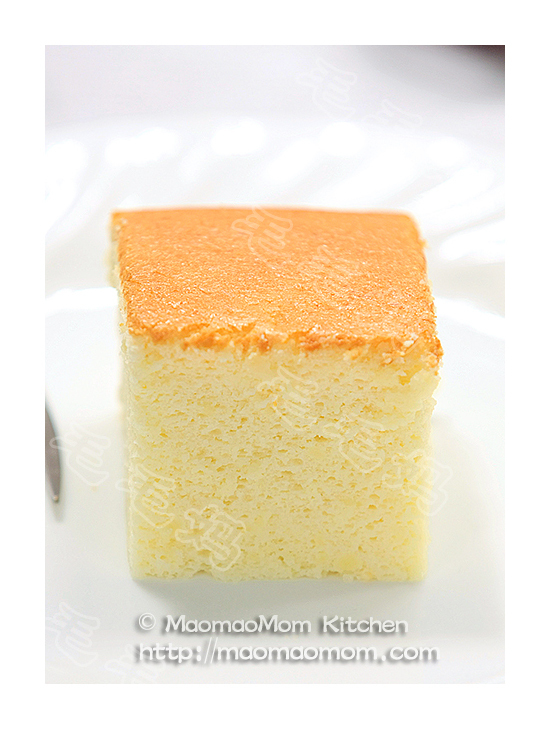 Add the remaining 1.5 tbsp tapioca starch (Picture 5) and knead to combine. Finally add 2 tsp lard (Picture 6) and knead until the dough is smooth (Picture 7). 3: Rub small amount of oil on the dough and divide into 3 equal portions. Cover the rest with a damp cloth while working on one portion. On an oiled working surface, shape the dough into a log about 1 inch in diameter. Cut into 5 equal portions (Picture 8). Roll each one into a ball in your palms (Picture 9). Press down with a cleaver or pastry scraper (Picture 10) into an 11-cm disc (Picture 11). If it is too hard to flatten, roll it out with a rolling pin. 5: Place dumplings on parchment paper squares on a steamer rack and brush the dumplings with garlic oil. Fill the steamer with 3 cups of cold water. Bring water to a boil over high heat. Place the steamer rack in the steamer and steam for 5 minutes. Remove from heat and place steamed shrimp dumplings on a serving plate. Yummy! 1. Make sure to use the boiling hot water to make the dough. If in doubt, heat the warm water in a microwave oven to make sure the temperature of water reach the boiling point. 2. Cover the unused dough with a damp cloth to avoid cracking. 3. To make the garlic oil, mix 1 tbsp freshly minced garlic with 1.5 tbsp corn oil. Microwave for 30 seconds. Stir and microwave for another 30 seconds. 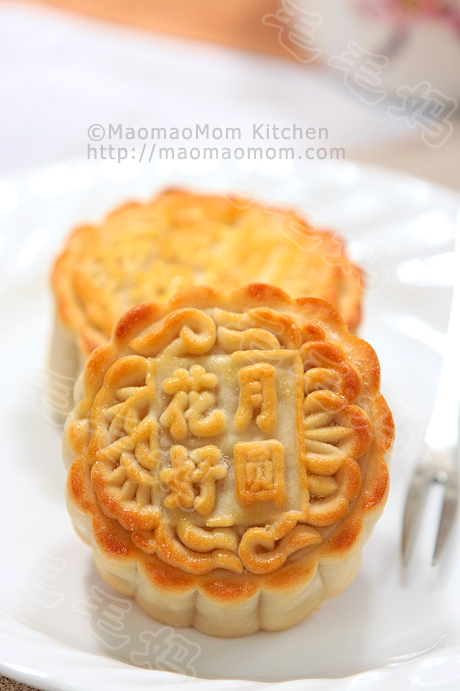 This entry was posted in Appetizer, 点心 and tagged Dim Sum Dishes, Dim Sums, Lard, Shrimp Dumplings, Wheat Starch. Bookmark the permalink. 毛毛妈, 你的菜谱太棒了. 用别人的方子总是做不好. 用你的方子从来就没失败过. 现在做点心蛋糕我再也不看别人的方子了. 都是你做啥我做啥 哈哈. 真心感谢你. 为我家的餐桌添了那么多美味佳肴. 祝你母亲节快乐!!! 你好！Is it OK to make the 虾饺 in the evening and steam them the next day morning? I have been following some receipts like rice cake or purple yam cake from your website for a few month. your receipts are very helpful and the cake taste very good. Thank you very much. I would like try more your receipts, but somehow I could open them from your web anymore. is it your website in maintaining? Thank you again.